zig zag or ric rac what ever you call it, call it done! 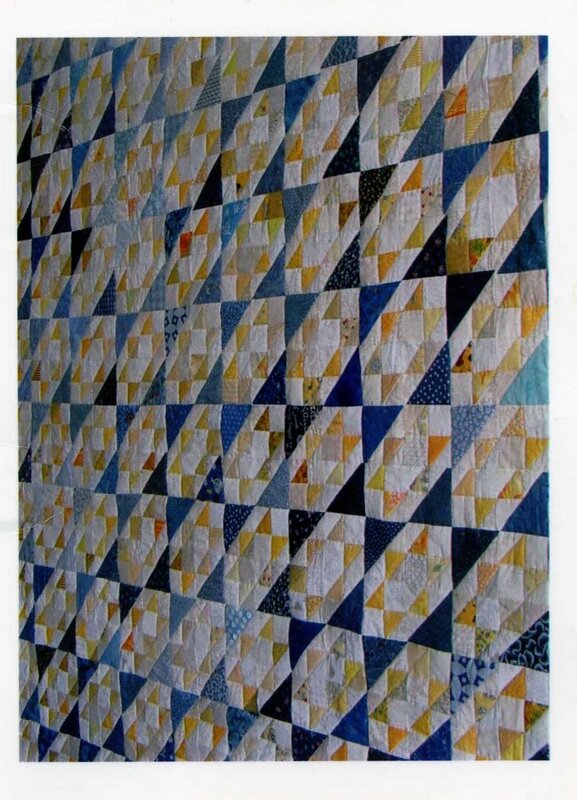 This is obviously not an Amy quilt (although I am known to add in stripes and plaids & those tonal blues and yellows would be welcome in a blue and yellow quilt any day....) but I have been "stretching" myself artistically. So this is my all Robyn Pandolf quilt. It is a zig zag quilt (click for free directions.) 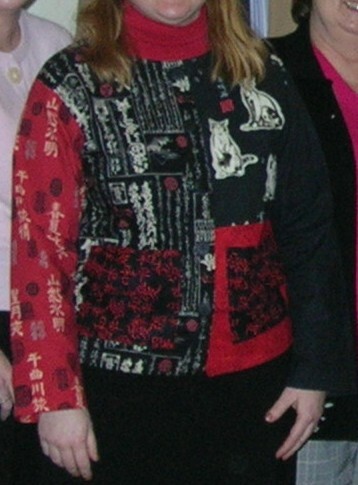 My size was based soley upon how many nickels I could get out of my 1 piece of background fabric. It took me a while to figure out how to get the units top actually zig-zag. I am sure some of the people I asked were thinking, "How dumb is she?" But I could not "see" it. (Its the way the two rows go together & I was convinced that each row would zig or zag.) I hope you enjoy the close up as well as the back. (These aren't my fabrics, so I wanted to use it up!) I actually wrote my label on the stripes on the back. This might also be my first piano key border. The binding is not shown here, but it is scrappy as well. :o) Aren't those free hand feathers great? I was so happy with that choice. I thought I wanted straight zig-zag lines for the quilting... (My friend thought I was ill when I showed her my "Sweet" quilt. I like it, but I am glad to have Robyn out of my system. This one is for DebR who graciously shared an 80's photo with the world. (I will NEVER be that brave!) And whose baby photo made me say, what a cute baby & to wax poetically about my own baby photos. I was a cute baby, bald but cute nonetheless. (My grandmother will vouch for this!) I actually like many of the photos of me up til Kindergarden..... This one was taken in December & I actually like it.... (Big shock as I usually do not like my picture...) I hope my wedding photographer can capture me in a similar light come February 19th. I still like this quilt. I love the way it "glitters" & all of those wonderful fabrics still make me smile. What does it mean when someone doesn't reply to your comment? Do you keep visiting a blog where the blogger does not reply to your comments? Am I taking it too personally? Should I just do what I want and not worry about wether or not I get comments or replies to comments? I am 1/2 way to be caught up on my blog reading - just as well as the after holiday realities of work are fast approaching. But the photo I promised will have to wait until (tomorrow - if my co-worker remember to scan it at home tonight and e-mail it to me so I can post it...) becasue the antique scanner has officially died! 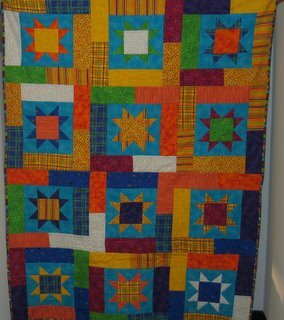 However, while I was reading Leah's blog I was reminded of an "African" quilt that I made once upon a time ago. Here it is: "I Dreamed of Africa." Background story (becasue there is always a background story...) I started and finished this quilt quickly! 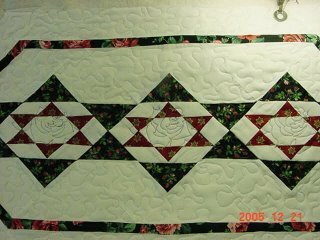 I saw an episode of Simply Quilts where the lady made the border while piecing the blocks.... The blocks are on-point - that is the secret.... I wanted to try it! I had an idea in my mind - you see I purchased tow sets of Ami Simm's Mommy's fabric line - the natural & the bright. I really wanted to piece them together and make "Some like country, Some like Rock & Roll." That NEVER worked, but I did use 1 bright on this quilt - the "special" border..... (If you look closely you will see blue in the 9-patches on the edge. Go ahead, click on the hyperlink again.) I also tried to do some funky half light, half dark thing.... I think my major mistake was using the border print as alternating squares..... (You see I wanted to use some of each of the fabrics from my "set." I was scrappy when scrappy wasn't cool...) I only noticed the border boo-boo after the fact..... But it was donated to a great cause & someone got a GREAT deal on a quilt. I am going to read first today. Later, I will post a photograph of one of my favorite quilts. (Also one of the first!) But it has to be scanned first - by a co-worker who knows how to scan & after it scans - a long time on the antique scanner! In the meantime, if you haven't already, please join my frapper map. Or just check out where we all are located! For your viewing pleasure, here is a table runner that I made to cover the challah at my wedding. (Those fabrics were used in the quilts that I made for my Brides Maids.) It is an older Atkinson Designs pattern. It will be bound with the fabric that was used as the narrow inner border. The first explanation comes from the time of the Israelites' wanderings in the wilderness, when God sent manna from heaven each morning to feed them. The loaves are covered with cloth, like the manna was covered with morning dew. And occasionally, "What is a challah?" From the dictionary: A loaf of yeast-leavened egg bread, usually braided, traditionally eaten by Jews on the Sabbath, holidays, and other ceremonial occasions. 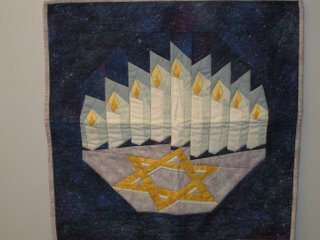 Happy Chanukah & Nickel Quilts (a discourse on my style) SCRAPPY! If you know anything about me and quilting, you know that I do not care for paper piecing. 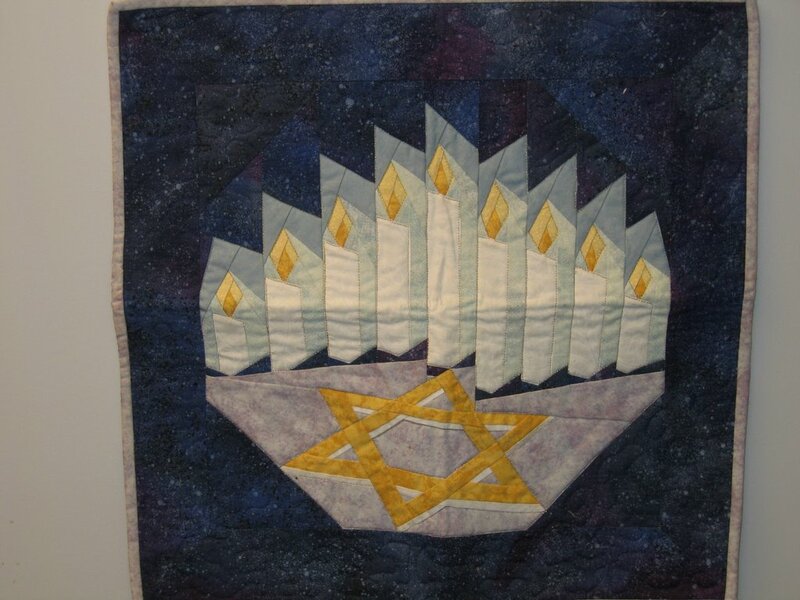 However, Judaic designs are few and far between so I bought this one from paper panache. 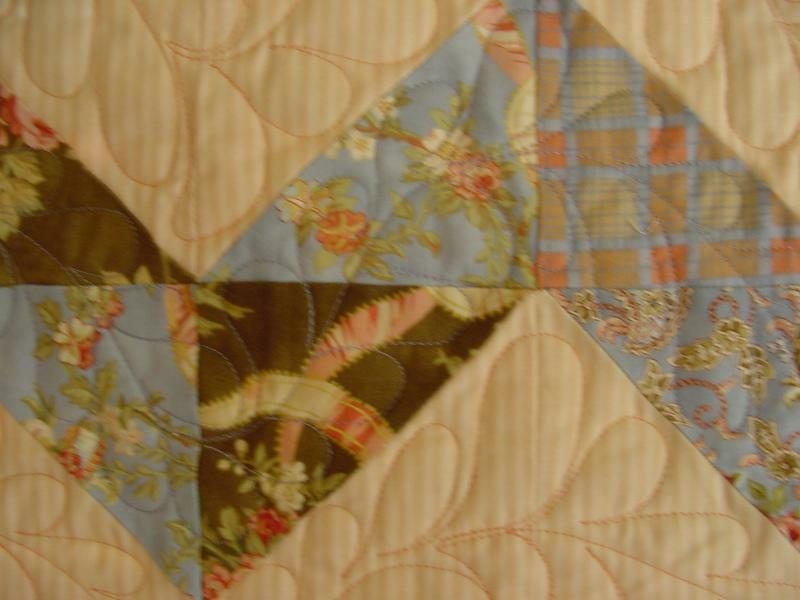 (There are a lot more available now, but this quilt is several years old.) 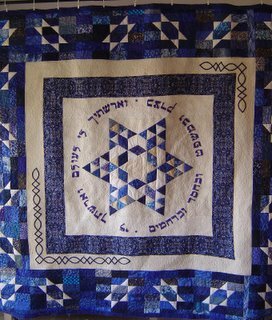 Click on the hyperlink for one of my favorite resources for Judaic quilting, she has several patterns (if not all) available for sale. I own +90% of them! Another great resource for reading about and seeing quilts that others have made is Judaiquilt. 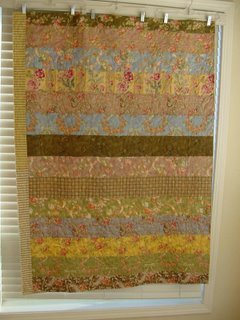 From Pat Speth's two books, I have done.... Jacob's Ladder (similar to that shown in the book), Beach Party (Rather different that the one in the book) , & My pinwheel from More Nickel Quilts. Only the 1 photo so far. 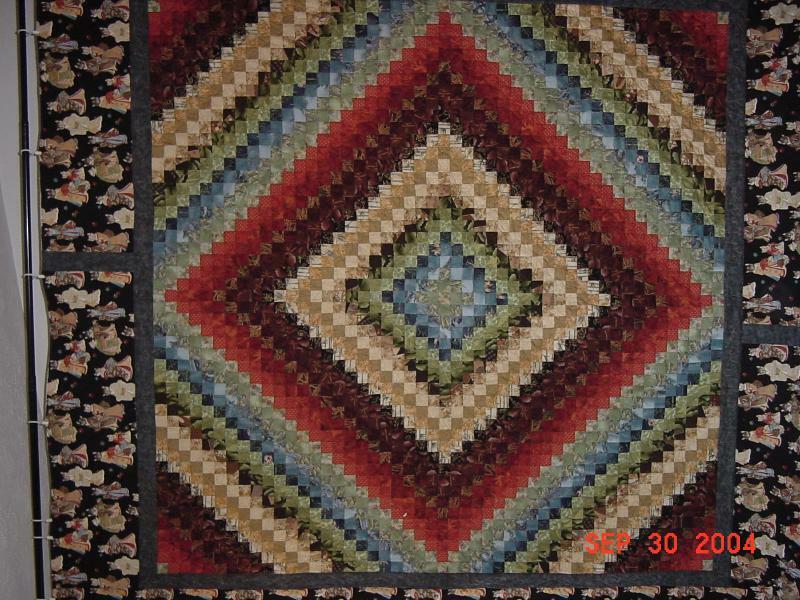 Unlike the first book, there are not any photos of the quilts in the book on the website. All three of mine are just tops. Also from the second book, I plan to do the cover quilt "Woodland Clover" in Orientals, & there is at least one that I want to do in Batiks. From the Nickel Quilts book, I have started Paducah 9-Patch (very similar coloring) & Shaded 4-patch (mine is Autumnal - sky blue background - and may be pieced more randomly - I only have it cut out not sewn - so my options are still open!) I plan to do Morning Star & Autumn Stretched Star with my novelty prints! 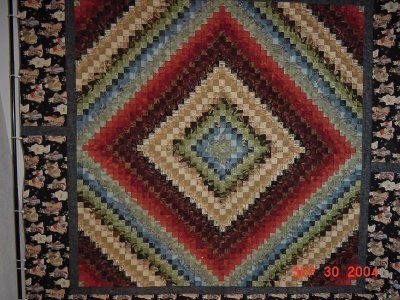 I also plan to do Arlington Square, but the coloration is still up in the air(I am thinking black on white for the lights & brights for the rest...) Finally, the last three quilts I plan to do "Kitchen Sink" style - everything goes! They are All that Glitters, Tillies Treasures, & Sunny Lanes. Besides my "Main" thing is scrappy and when I want to do a blue & yellow quilt, I want a lot of different blues and yellow prints, not just the bright ones! 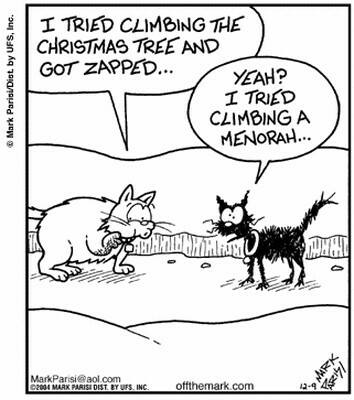 This is an old cartoon, but a favorite of mine! And the little singed kitty reminds my of my little boy cat, RB. You see he has actually singed his whiskers on a candle flame! The history of Chanukah begins in the reign of Alexander the Great. Alexander conquered Syria, Egypt and Palestine, but allowed the lands under his control to continue observing their own religions and retain a certain degree of autonomy. Under this relatively benevolent rule, many Jews assimilated much of Hellenistic culture, adopting the language, the customs and the dress of the Greeks, in much the same way that Jews in America today blend into the secular American society. More than a century later, a successor of Alexander, Antiochus IV was in control of the region. He began to oppress the Jews severely, placing a Hellenistic priest in the Temple, massacring Jews, prohibiting the practice of the Jewish religion, and desecrating the Temple. Two groups opposed Antiochus: a basically nationalistic group led by Mattathias the Hasmonean and his son Judah Maccabee, and a religious traditionalist group who became the Pharisees. The revolution succeeded and the Temple was rededicated. At the time of the rededication, there was very little oil left that had not been defiled by the Greeks. Oil was needed for the menorah in the Temple, which was supposed to burn throughout the night every night. There was only enough oil to burn for one day, yet miraculously, it burned for eight days, the time needed to prepare a fresh supply of oil for the menorah. An eight day festival was declared to commemorate this miracle. Note that the holiday commemorates the miracle of the oil, not the military victory: Jews do not glorify war. Chanukah is not a very important religious holiday. The holiday's religious significance is far less than that of Rosh Hashanah, Yom Kippur, Sukkot, & Passover to name a few. It is roughly equivalent to Purim in significance. The only religious observance related to the holiday is the lighting of candles. On the first night, one candle is placed at the far right. The shammus candle is lit and three blessings are recited: a general prayer over candles, a prayer thanking G-d for performing miracles for our ancestors at this time, and a general prayer thanking G-d for allowing us to reach this time of year. It is traditional to eat fried foods on Chanukah because of the significance of oil to the holiday. Gift-giving is not a traditional part of the holiday. It is extremely unusual for Jews to give Chanukah gifts to anyone other than their own young children. Another tradition of the holiday is playing dreidel. The traditional explanation of this game is that during the time of Antiochus' oppression, those who wanted to study Torah (an illegal activity) would conceal their activity by playing games with a top whenever an official or inspector was within sight. A dreidel is marked with four Hebrew letters: Nun, Gimmel, Heh and Shin. These letters stand for the Hebrew phrase "Nes Gadol Hayah Sham", a great miracle happened there, referring to the miracle of the oil. 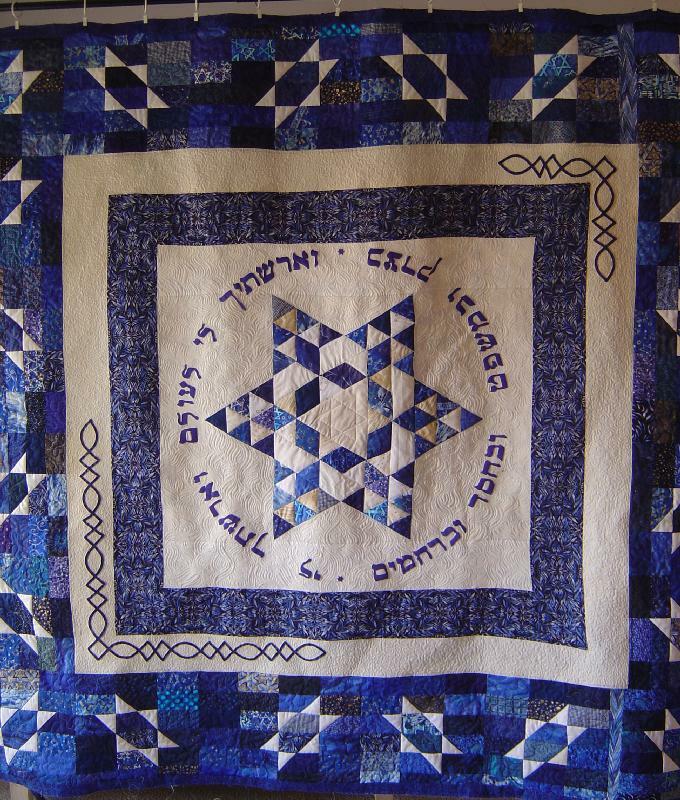 I'll post my Hanukkah quilt tomorrow. This is a UFO of mine that I really would like to finish... But it is not "big enough." I have several ideas on how to grow it bigger, but have I gotten a "roundtuit." Heck no, this photo was taken several years ago & it is in the same state on undone. This was a mini-group project. 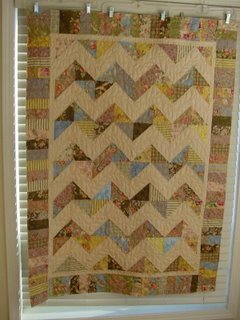 I did the twisted tails block in the middle - the only fabric repeats are in the triangles. (My only rule was to keep it scrappy.) My friend Kathy added the braid on two sides - and repeated the fabrics..... (At which point I wish my "rules" stated that the round had to go all the way around) Genie followed my ruled to a "T." no repeated fabrics & several different blocks. My friend Deborah does not care for cats - so she added the red round and the mice and cheese. Finally, my friend Nancy used her cat and black collection on the final border. Will this darn training ever stop? This one promises to be a sleeper - my supervisor chose it... I don't even want to know what it is about, it is bad enough knowing that it will last all day long! My second & last attempt at S&W was a Stack and Oops. I forgot to unfold the fabric before cutting it. So while the first three repeats looked great the last three did not... Since I cut-out enough triangles (Yes, I got that far before figuring out my mistake!) for a king sized bed quilt I tried to match what I could - make lemonade out of my lemons..... "FUGHETABOUTIT" I set them aside & started on something else.... The birth of a UFO! (Since then I trimmed the triangles, all 1 billion of them, into squares for a scrappy Irish Chain. Thanks Bonnie for the inspiration.) BTW My fabric selection for the second S&W was 100% better than the first! 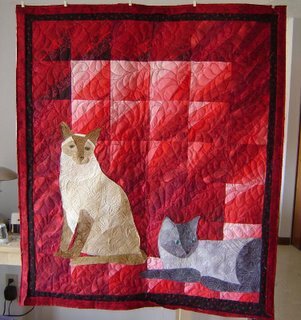 I posted about this The Calico Cat: cat quilt'>cat quilt earlier. However, if you want to hyperlink to a free online quilt pattern, a favorite online quilt shop, etc. you can type something to hyperlink "Equilter" as an example (Open equilter in another window and copy the URL) once the equilter is highlighted, click on the "green dot" near the alignment guides then paste the URL for equilter in the box (make sure thet the http:// is only there once.) then click ok. equilter (or what ever you highlighted) will the show up underlined and in a different color. (FYI If you do not highlight something and still use the green dot and clcik on o.k. the URL will appear in your blog.) I hope that makes sense, if not drop me an e-mail and I'll try again. The baby Panda was wonderful! He was playing with a milk crate (new toy) when we were there. The milk crate is a favorite toy of his dad. Mom & dad were eating while we were there. Dad was more active - climbing on some of that available wood. Mom was just munching on her fruitsicle. Tomorrow I get to go see the baby panda. (I did it Barbie!) Boy now I really do feel like an idiot, that hyperlink thing is easy-peasy! I only tried for 3 hours the day that started to issue tickets to get 11:30 on Friday. So I have to leave my apartment at 9a.m. to catch a bus to the subway to walk to the exhibit 1/2 hour early - to get my 10 minutes in the Panda exhibit. Hopefully Tai Shan will be active and visible... Afterwards instead of trekking back to work, we'll (My girlfriend Vanessa also got the day off) go to Amazonia - an indoor exhibit also at the zoo. If I am quiet until Monday.... Those are my excuses. Thanks for all of the wonderful comments about my Trip Around the World! How to use a fabric that you just can't cut. This quilt is titled "The Tabbies Take a Trip Around Tokyo." (in the close-up below you can see that the cats are wearing kimonos.) 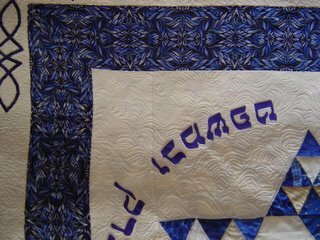 The title is written into the top inner border with thread as part of the quilting, with my name, the date, and location quilted into the bottom inner border. (the sides have leaves. I got to class and there were a lot of fabric selections that "made sense." (you know light to dark purple and green, all Robyn Pandolf, Americana, etc.) and then there was mine... I had to show my "inspiration piece" for my fabric to make sense for my fellow classmates. In the class we made 1 quadrant..... And I stalled.... not sure why, but I signed up for the second go around (our guild had a lot of interest in this class.) so that I could get going again. I finished it soon after the second class. Oh yeah, back to my original post idea.... 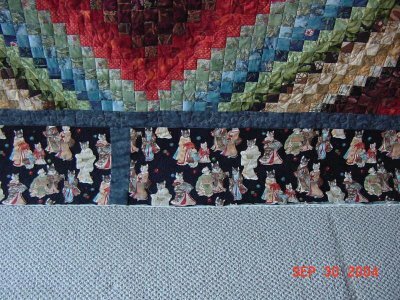 I used 10 inch wide strips of the cat fabric in the border - so I could see the cats. If I had tried to piece with them, they would have been all chopped up & that would not have please me very much at all. There is a pattern that I purchased, "Just Can't Cut It" by All Washed Up. that uses a big square of fabric. 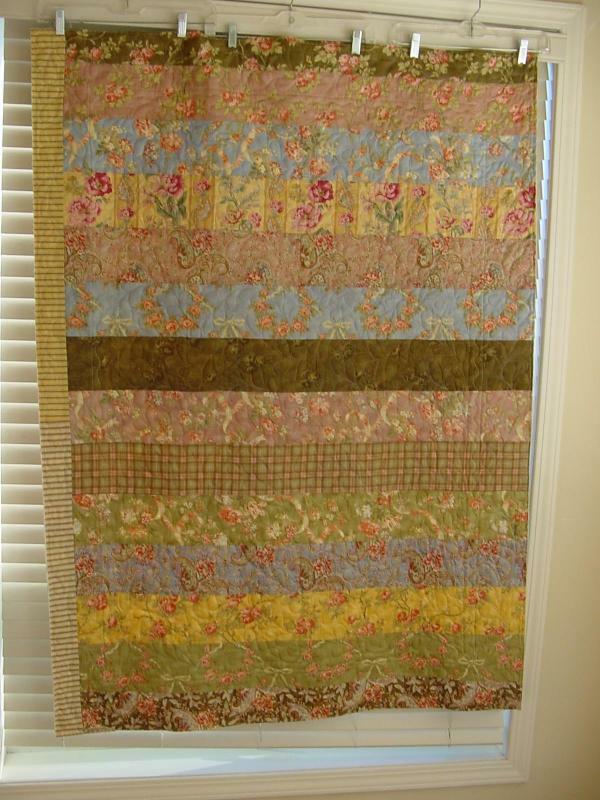 You can fussy cut the fabric and piece with it in traditional quilt blocks like Attic Windows and Hole in the Barn Door. I am sure there are other ideas floating out there..... Care to share any with me? I fixed my sidebar issue (Thanks Judy) I had to shrink a URL... I need to read my hyperlink instructions again.... Anyone know if there is a "Blogs for Dummies" book, or something similar? I must have forgot to mention that Michael & I are going to Australia for our honeymoon trip. We are going several months after the actual wedding so if it sounds like we are doing too much touristy stuff and not enough honeymoon stuff - don't worry! I finally got caught up with reading blogs! :o) You gals have been busy! 2. I passed my test 90% - don't tell the teacher was not supposed to grade it in class. And again I thank hime for coming in early so that I could take the test. The test was originally scheduled for 8:30, but that got pushed back to 10:30 becasue of the snow. The teacher and I arrived at 7 - with our traffic that was for the best for both of us. Add the gal who arrived close to 8. 3. I did my "dry run" hair and make-up for the wedding & I am satisfied. (No amount of make-up & Hair spray will make me look like Cindy Crawford!) The roads were only wet when I drove to the make-up lady & when I left they were drying out! 5. Made it to my girlfriends house - took her dogs for a walk, and waited a few minutes for her to get home so we could go get a manicure. 7. 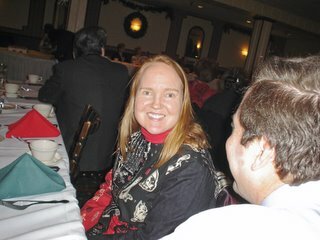 We went to her offices holiday party & a good time was by all. The food was even edible. Open bar was a treat, but 3/4 of the things that I would have liked were not available. They had free tarot card readings.... Not something I would pay for, but it was fun to do for free! I don't remember the specifics, but it was all good! 9. I CUT & SEWED THE TABLE RUNNER IN ABOUT 3 HOURS! Why did I procrastinate on that? 12. That is where I have been and what I did! I was too young to understand, but I do remember listening to The Beatles as a child, teen, young adult, middle adult.... (Thats' where I am now.) Any thoughts.... Anyone else a fan? Well, yesterday we got out first taste of winter.... I fell twice walking to my busstop - my pants legs were soaked and I was mad! (I pay too much rent not to have clean sidewalks - PERIOD!) But I am in training, so instead of turning around and going back to bed (Which would have involved walking uphill anyway) I continued. By the time I got home, I was sore and miserable, so no sewing for me. (I did not even play with fabric or trim the pile-o-scraps.) I heated some leftovers & rested with my cats. Here's hoping that I have more to report tomorrow and that you all have productive days... I am off to class. BTW I am in a different training session this week at a different location. Right now, I do not know the PC availability... So my blogs (reading & writing) may be far & few between. News & Advice - & A photo! Again sorry about the small photos. This are "close-ups" of a quilt that I made for Michael last year. 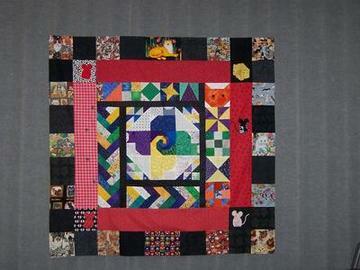 He is a Jets fan, so the theme of this quilt is Jets - whose colors happen to be green & white. 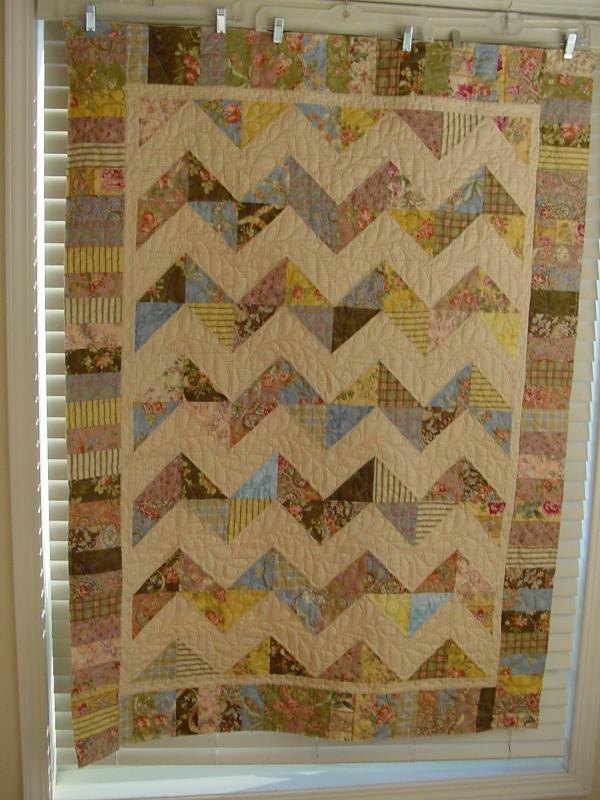 I call this quilt a "bricks quilt" and it is a good candidate for scraps. You might be able to see the bricks pattern in theses photos. (Picture the green as a brick & the white as mortar.) I set mine on point - hence the dark triangles that you see in the left picture. The bricks are 2.5 x 4.5 rectangles while the mortar strips are 1.5 x 4.5. They are a rail fence variation. I am currently working on a batik one with 1 black batik as the mortar and scrappy - hopefully none alike - for the bricks. I don't know why I originally bought the black batik, but I have enough... (You use quite a bit of those 1.5 inch strips... I need to cut a few more so that I can finish my blocks and start assembling them into a quilt top.) You can do this 100% scrappy with 1 mortar color, or you can do a two color combination - blue bricks with yellow mortar strips, 30's with white, florals with green... It is an easy pattern and it feels good to use your scraps! I need to go on a diet..... The wedding is stressing me out and so food is finding my mouth.... Any advice? I guess sitting and sewing isn't muh help either.... With that said, I worked on an older project during my time off today. (Yeah, after I finished my test at 11:30, I was off for the rest of the day.) It is a "Summer" quilt - the background is 1/3 sand, 1/3 water, & 1/3 sky with brights... 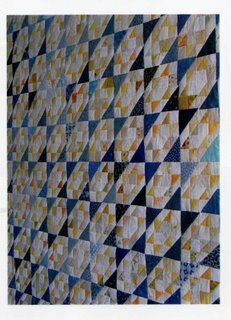 The pattern is similar to Pat Speth's "Beach Party" quilt in More Nickel Quilts - her title gave me the idea. I now have my 1/3's pieced together - just need to join them. I had the "blocks" done for quite a while. BTW The back will be a "Bonnie back" - 10.5 inch squares sewin together - all of those squares are "beachy" novelty prints. I also got a nice batik for the border and backing. Turkey and rice casserole recipe, made with long grain and wild rice, chopped vegetables, and an easy sauce. My fiancee is eating this for lunch today & we have enough for another meal or two. 2 yards of a gold/gold Oriental for a Jacket... It goes perfectly with the body fabrics & the fabric that I already got for that purpose will look better as a background for piecing or applique anyway - too creamy for a yoke. Update on the current star quilt... I cut border pieces last night - I am going to do the piano key border very scrappy and fairly pink.